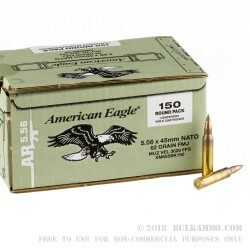 This XM855 loaded 5.56mm ammo by Federal is the same ammunition that is produced for our United States Military. It is extra that they have been given permission to sell to the public. Lucky for us, that gives us the ability to offer it to you for a great price on a high quality, NATO spec round. 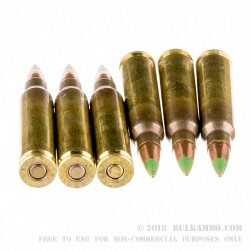 .223 Remington is the common counterpart to the 5.56, but does not have some of the features in many cases that the 5.56 has. 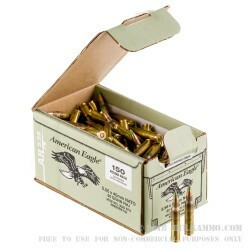 This ammo has a sealant around the primer and case mouth. This allows it to resist moisture better than a cartridge without this feature. The famous green tip helps distinguish it from other projectiles that may not have the steel core. This partial steel core, allows it to fair better through intermediate barriers better than your average FMJ (ball) round would. This was originally designed to defeat pot metal helmets our enemies of that time were wearing, and has been adapted for use by civilians and the military for other reasons throughout the years. While shooting this round it may be best to avoid steel targets, and it is possible that an indoor range may not allow this due to the increased likelihood that it could damage their bullet stops. It is still a great option for everyday practice, long term storage, and instances where shooting through obstacles may be required. Pick some of these historic rounds up today, produced from one of the most advanced facilities in the US. Very good experience. Fast shipping. 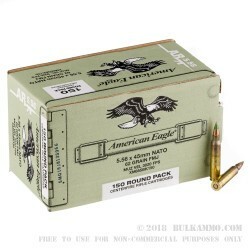 Great and accurate ammo for the money. No lose of ammo in the 150 rounds shot. Q: Will this work in my rock river lar15. A: Hello Brian, These 62gr. FMJ rounds by Federal n 5.56 will work in your Rock River LAR15 as long as it is chambered in .5.56 and not .223 only. You can find the markings on the left side of the lower receiver or on the barrel as well typically. Q: Is this item non-corrosive? A: Hello, These 62gr. M855 rounds in 5.56 by Federal are non-corrosive. You will not have to worry about corrosive ammo with these.